This is my cat Prince, and yes, I named him after Prince Fielder. 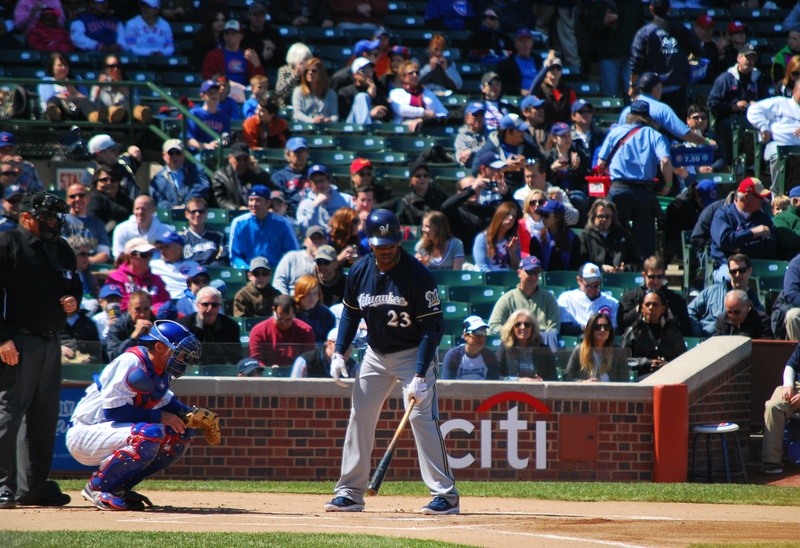 I got him back in 2006 and Prince was coming off his rookie season for the Brewers, and I knew he was going to be awesome. During this past offseason, I was pondering a name change since Prince was going to sign with another team. I debated going back to his original name (Simba), or The Cat formally known as Prince (but only if he signed with the Cubs). 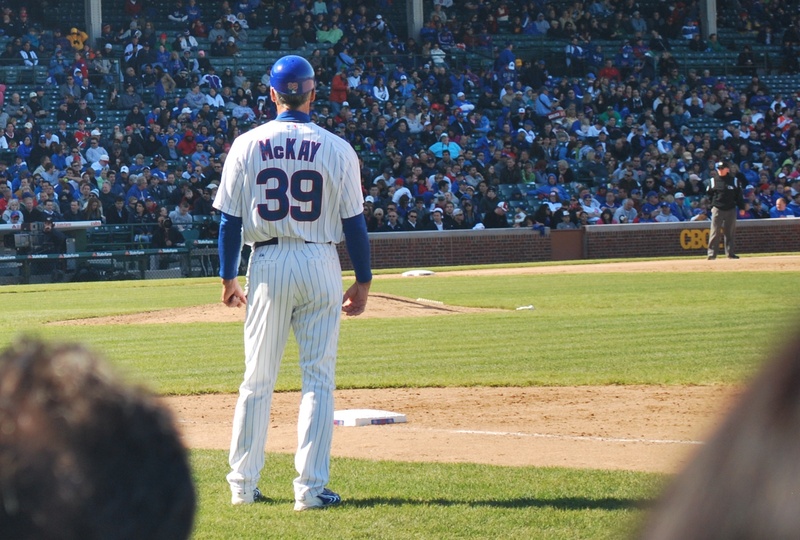 Since he didn’t sign with the Cubs, I figured it was alright to leave it as is. I snapped this picture quickly as I was leaving, and didn’t get a chance to look at it until now, and laughed out loud when I saw it. 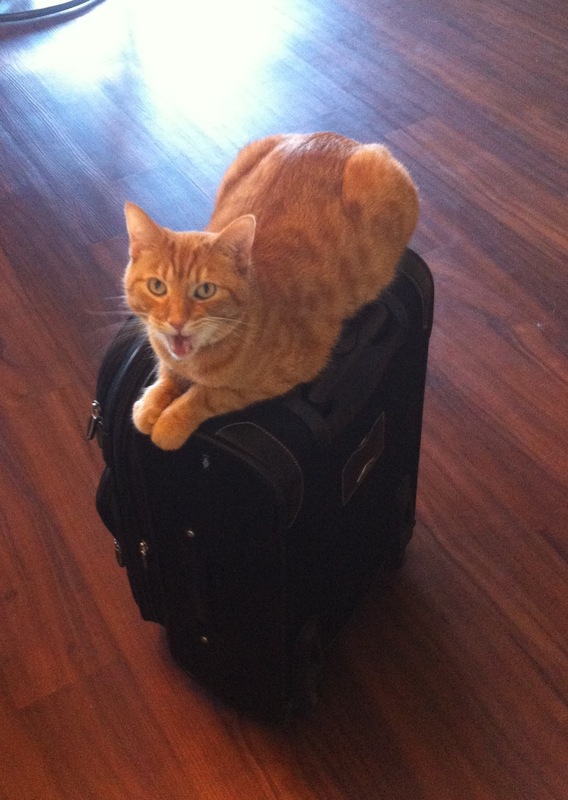 I think his expression is “OH MY GOOOOSH” or “SAY WHHAAAAAT?”, or “DON’T LEAVE MEOW!”. Back to Midwest Family Broadcasting. 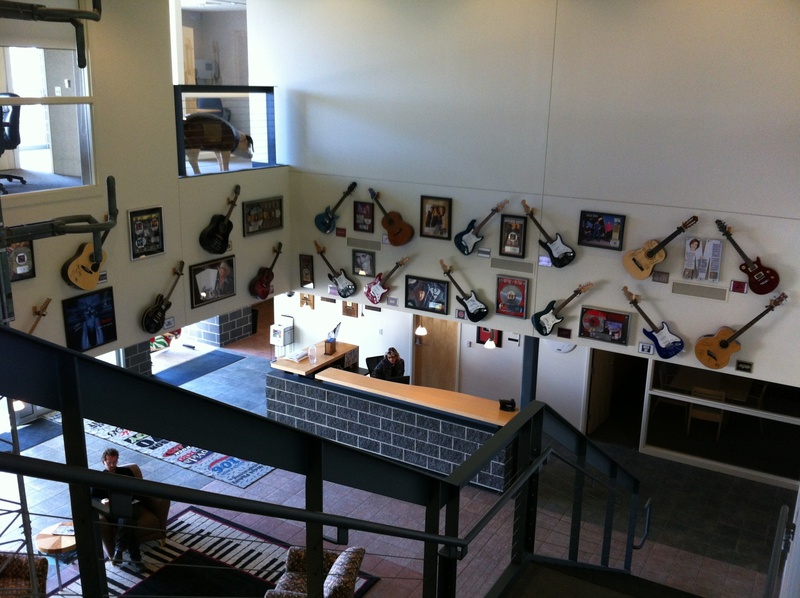 Todd said that the owner really likes guitars, and has a bunch of them all over the building, as you can see from the picture of the lobby below. Most all of them are either signed by famous musicians, or contain cool artwork. Todd brought up the possibility of doing something on air on a few of the morning shows, and I said I was all for it. I gave him a few dates that should work, which are limited, since there are 18 off days from now until October 3rd. I will most likely be returning in a month or so I didn’t take any more photos. There was some really cool/interesting stuff, and I’ll be sure to bring my DSLR when I go back. I left at 3:30 and headed to Milwaukee, but made a pitstop in Delafield to get some dinner at Noodle’s and Company. I had gotten a $25 gift card for Christmas, and a $50 gift card from a very generous coworker (Pam), as a going away/”that’s f****** awesome!” present. Pam had once asked another coworker if they thought my phone got text messages, and I still give her a hard time about that, but I digress. I usually get either the Indonesian Peanut Sauté or the Pad Thai, yesterday I went with the former, and added chicken. 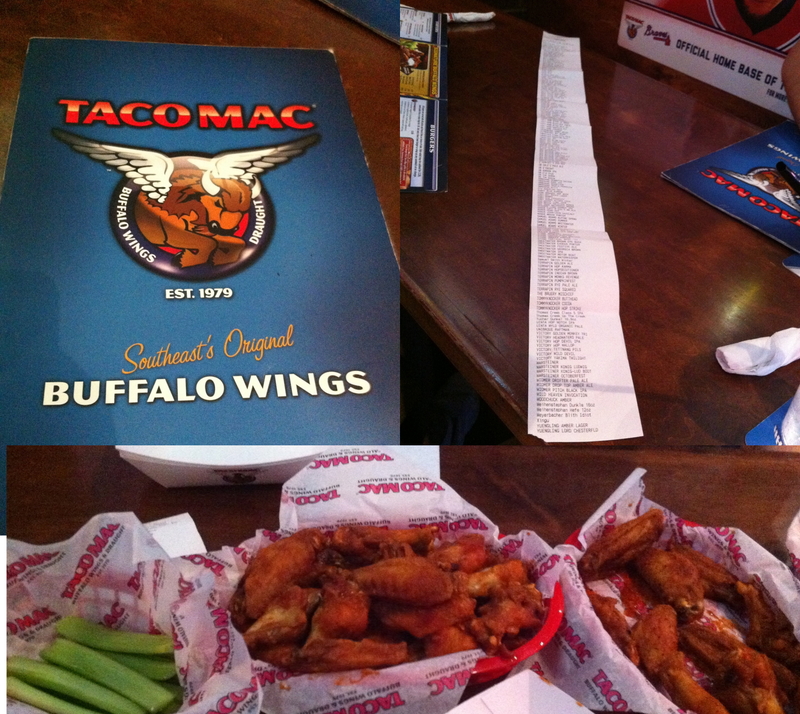 I think they gave me more than the normal serving, which is just what I needed, since I hadn’t eaten lunch. 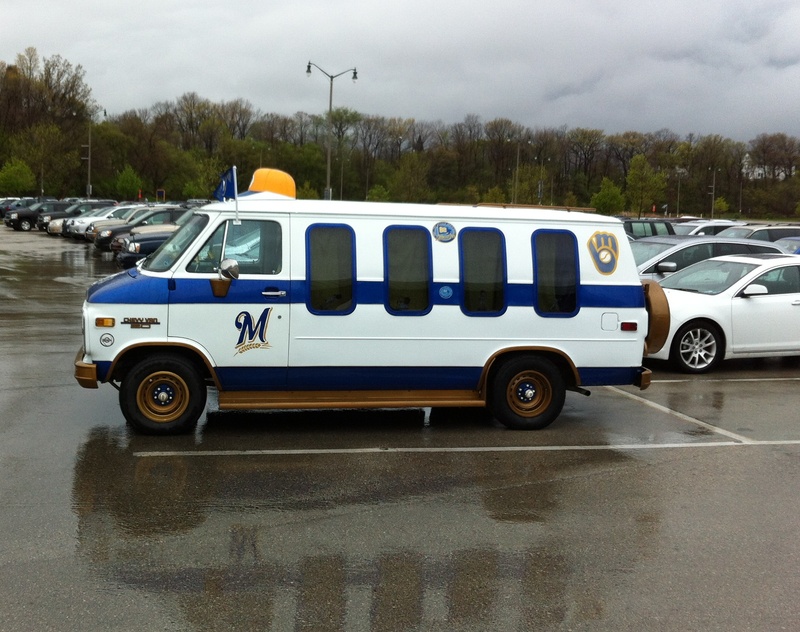 I drove to Miller Park and was surprised by the lack of traffic. There was still some slowdown but it went rather smoothly, despite it being 5:15 on a weekday, and a lane being closed due to construction. I probably just jinxed myself and now today’s traffic is going to be horrific. 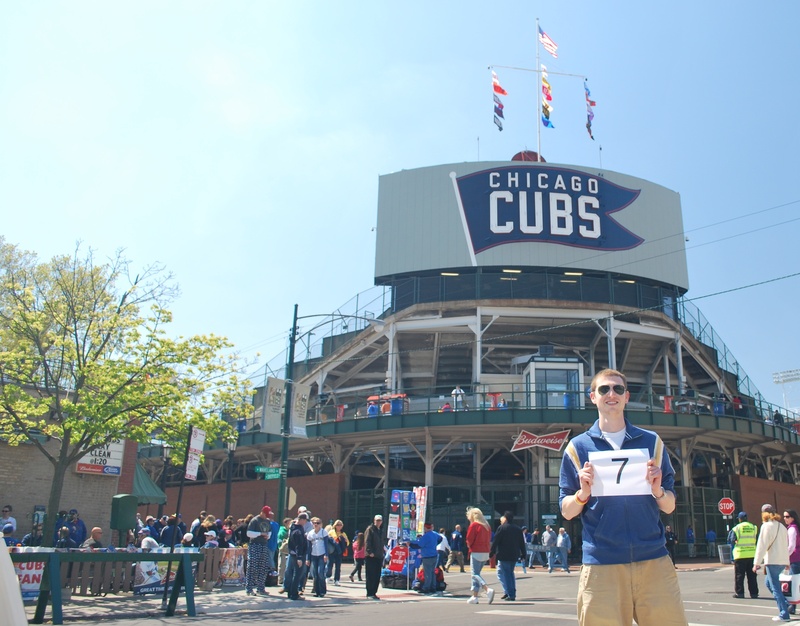 I went through the right field entrance, I headed straight for the upper deck, to get the picture for game number 11. 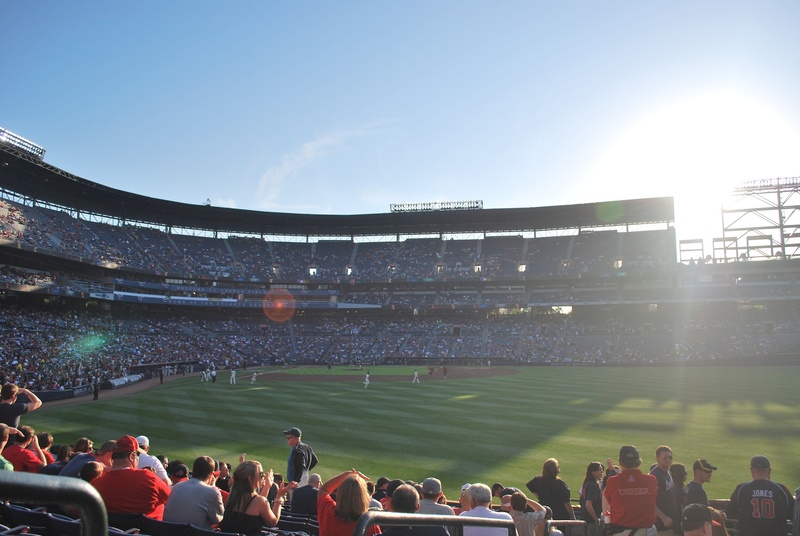 1) The upper deck concourse in the right field corner. There is just so much room up there. The nearby sections are generally only used during sellouts, so a lot of times there’s just an open concourse like this. This picture was taken about an hour before first pitch on a weeknight in April, so that also attributes to it’s emptiness. 2) A view from the concourse into the seating bowl, behind section 410. I always like looking into sections from the tunnel and seeing the foul pole, and in this case, Bernie’s slide as well. 3) A John Axford poster in the Loge Level concourse, near home plate. I hadn’t seen this one yet, and thought it was pretty cool. His nickname (at least for fans), is either Ax, or The Ax Man, so it’s very fitting. 4) The view from my seat during the game. I just thought it was cool how the sun comes through the panels in the upper deck, and illuminates the scoreboard and the supporting section for the roof panels. The picture isn’t accurate in the sense that the scoreboard was entirely legible, and it’s just washed out in the picture, but nonetheless. The game itself was absolutely spectacular, or at least the ending was. 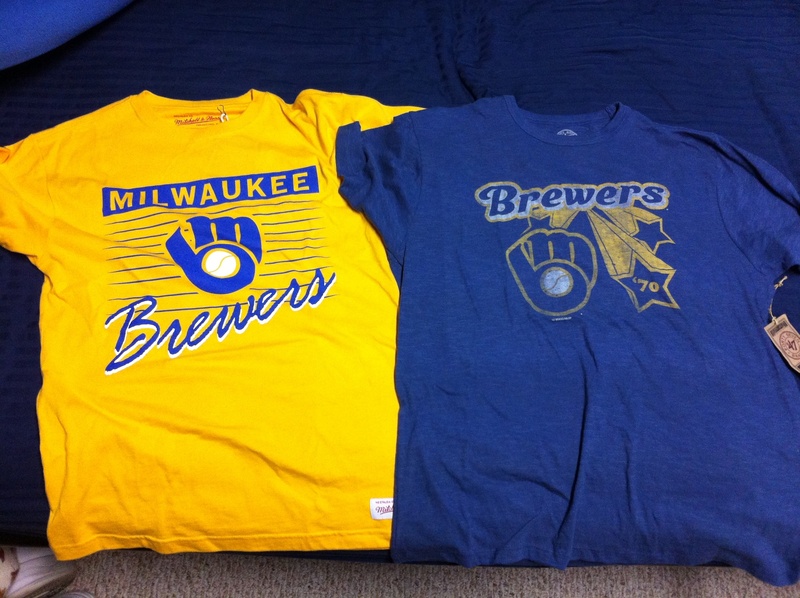 The Brewers built an early 2-0 lead in the second inning off of Gamel’s solo home run and Izturis’ RBI single. The Dodgers struck in the fifth with a solo run on an error, but if everything played out as it eventually did, the run would’ve scored anyways. The Dodgers tied it in the seventh on a RBI double by James Loney. The Brewers worked their squeeze magic once again (third time this year), and Aoki got the job done in the bottom half, scoring Gamel. It was looking like it was going to be one of those K-Rod – Axford shut ’em down type of eighth and ninth innings, but K-Rod gave up a two run shot to Ethier in the eighth, and things looked bleak. Enter Gorgeous George, as Dave (Annette’s boyfriend) calls him. Georgie (what I call him) sent everyone home happy with a two-run double in the bottom of the ninth with one out, and the crowd was in a frenzy. I was jumping around in the aisle like a child who was just given ten pounds of their favorite candy while trick-or-treating, but that is completely normal for me. 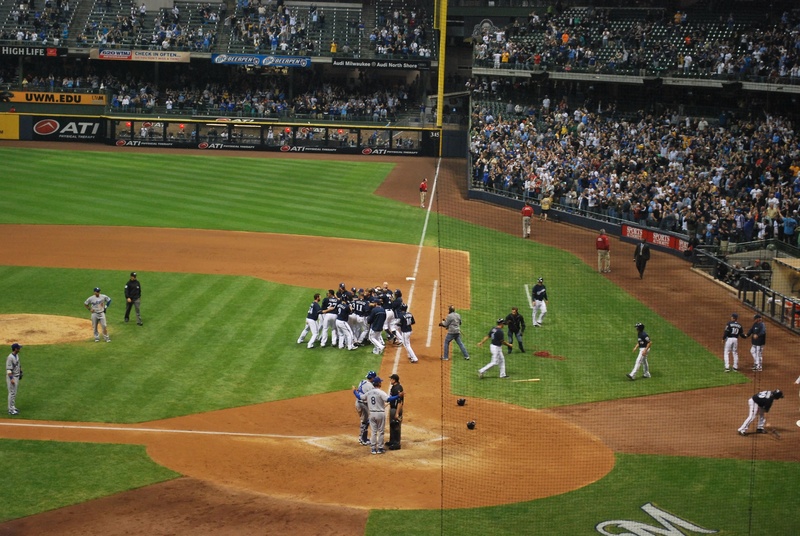 Gamel had a great slide and wound up scoring three of the Brewers five runs, and has his batting average up to .282. Big win for the Crew, and hopefully with Greinke on the mound tonight, we can duplicate it. Yesterday was my first off day, and I was pretty lazy. I got up to say goodbye to Annette, who had class in the morning, but then went back to bed and really didn’t get up until noon. Dave and I talked about baseball and other topics, and then he took me to the MARTA station at 2:45 before heading off to an appointment. I spent the 40 minute train ride catching up on some Words with Friends games and some emails that I had neglected. I got to the Airport around four o’clock, went through security, and went to find the Chick-fil-A. I had the spicy chicken sandwich, and wasn’t overly impressed. It reminded me of a Wendy’s spicy chicken sandwich. Don’t get me wrong it was good, but I wasn’t blown away or anything. It was my first experience with the Coca-Cola branded fountain soda dispensers with a touch screen. I’m not a big soda fan, but the number of options those things have is amazing. I went with Diet Dr. Pepper with Cherry, and then refilled with Dasani water infused with lime. I think they had about seven different variations of Sprite, and countless other variations. I read a digital edition of Sports Illustrated as I waited for my flight, which wasn’t scheduled to take off until 6:55. The flight wound up being delayed 15 minutes or so. If that’s the worst delay I experience this season, I will be more than happy, in fact, I’d be ecstatic. On the plane I watched the first two episodes of Eastbound and Down, which probably wasn’t the wisest choice because there are some inappropriate parts since it’s aired on HBO. Friends have talked about it for a while, but I had never gotten around to actually watching it, so I downloaded the episodes (legally, from iTunes) at Annette and Dave’s, and put them on my iPad for the trip. I got into O’hare at 8:15, and took the 25 minute train ride to the Logan Square stop, where I walked back to Alex’s. It is Jess’ birthday today, and they had cake and ice cream! I tell myself that it was also a welcome home dessert for me. I left at 9:30 and was planning on going back to my parent’s in Fort Atkinson. My girlfriend, Victoria, texted while I was on my way and said she didn’t have to work until 11am this morning, so I drove to Madison instead. I got in just before midnight, and my first real off day was a success. I’m extremely grateful that Alex and Jess, and Annette and Dave, were willing to host me for a few days. People like them allowed me to (try) and make this dream come true. I will always be appreciative of what they’ve done for me. The Brewers game is in just under five hours, and I need to get moving. I’m meeting with a guy who works for the company that owns the major Madison radio stations before I head out. More to come later. Friday started off with a 4:00 am alarm. 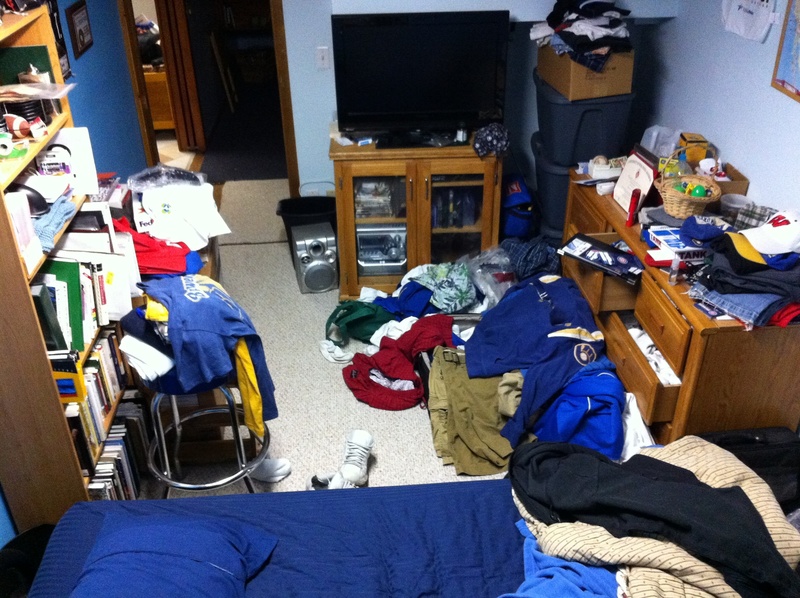 I had done all of my packing the night before this time, and was pretty much ready to go when I got up. I tiptoed around Alex’s apartment trying not to wake my gracious hosts. 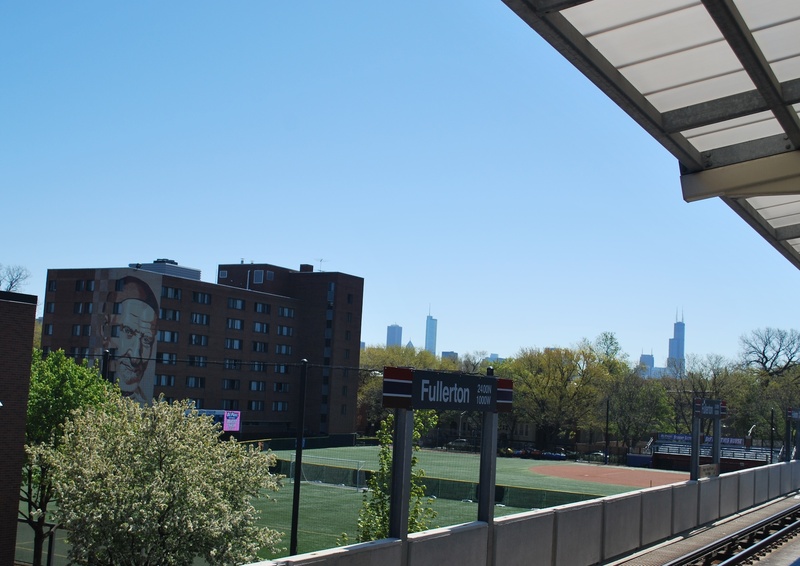 After leaving Alex’s apartment I walked the half mile up to the Logan Square L-Train stop, and caught the 5:08 train to O’hare. I got through the security checkpoint rather quickly, even though I went with the pat down instead of going through the body scanner. I could care less if they see what I’m working with, but if I can limit the amount of radiation I receive, I’ll do it every time. I know the amount of radiation you get from a body scanner is equivalent to what you get after only ten minutes on a flight, but still. I know things are more expensive in airports; my Egg Mcmuffin, hash brown, and orange was $5.66, while at a normal McDonald’s it probably would’ve been $4.50 or so. That comes out to a 25% airport tax if you will. I was not, however, expecting to pay $2.66 for two bananas at a Starbucks. Banana prices vary widely, but at Woodman’s in Madison I think they’re 39 cents a pound. Any way you look at it is over six times retail. I would’ve shopped around, but I was tired, and just wanted my daily potassium fix. The flight went smoothly, and I had chosen a window seat as usual. I like to be able to rest my head on the cabin wall, and not have to worry about my knees getting rammed by the flight attendants. As we were boarding the captain said it was going to be a very full flight, so I was expecting one or two empty seats. If that was the case then I got lucky, because there was no one in the middle seat of my row, beautiful. I was picked up at the airport by Annette, who also lived in the same dorm as Alex and I freshman year: Kronshage Gilman House ’05-’06! I dubbed our group of friends G-Unit, I’m not sure that ever caught on though. I probably hadn’t talked to Annette in over three years, but she was my contact in Atlanta, and was ecstatic to be hosting me on such an awesome mission. 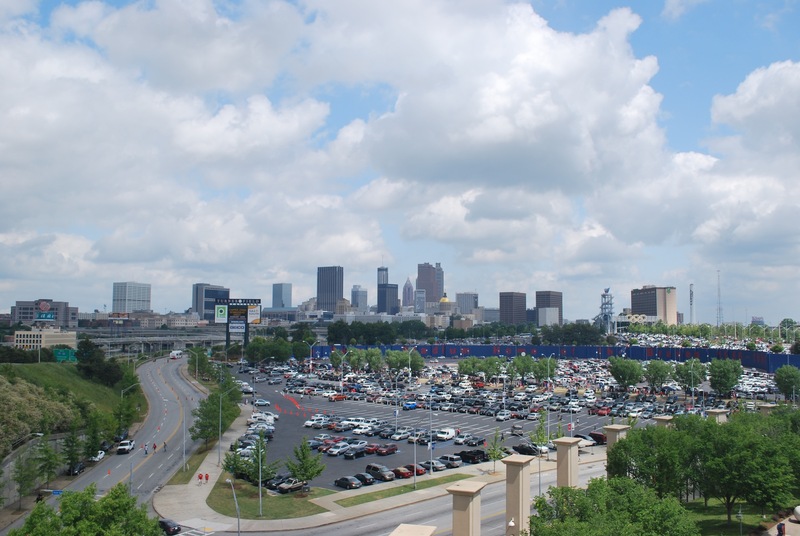 The Atlanta airport is south of the city, and Annette and Dave, her boyfriend, live northeast of downtown. 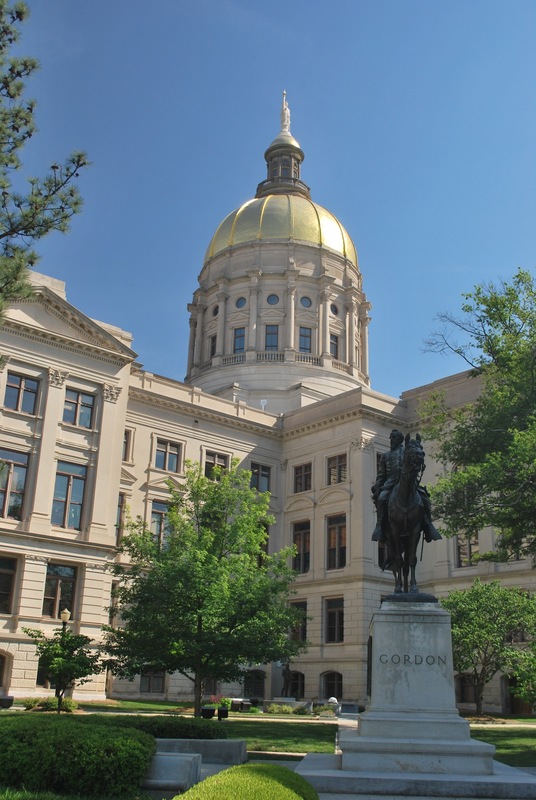 It’s about a 23 mile drive but with Atlanta traffic, you never know how long it’s going to take. 10:00 am traffic was good though, and it took about 25 minutes. Annette lives with Dave and a roommate, Amanda. Below you have their house, the couch I’ll be sleeping on, their two dogs acting like cats, and the dogs intrigued by my camera. 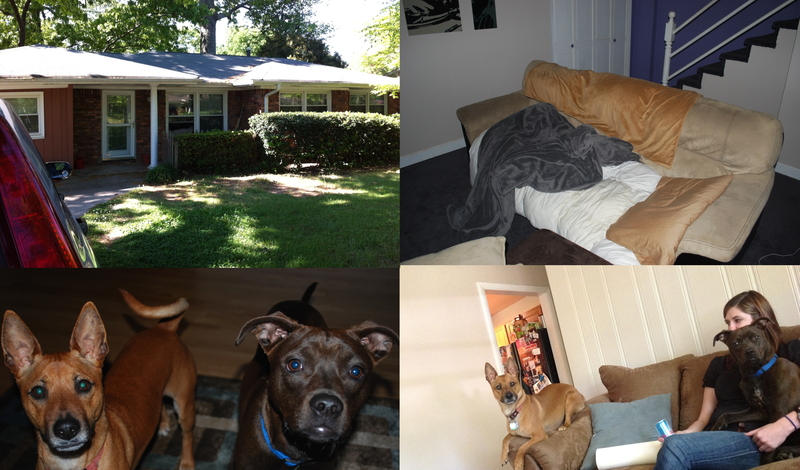 Boscoe, the light brown one, is part Basenji part chihuahua, and likely something else. Jozy is a pit bull lab mix, or so they think. Annette and Dave are both in Pharmacy school at Mercer, Dave is in his third year, Annette in her second. 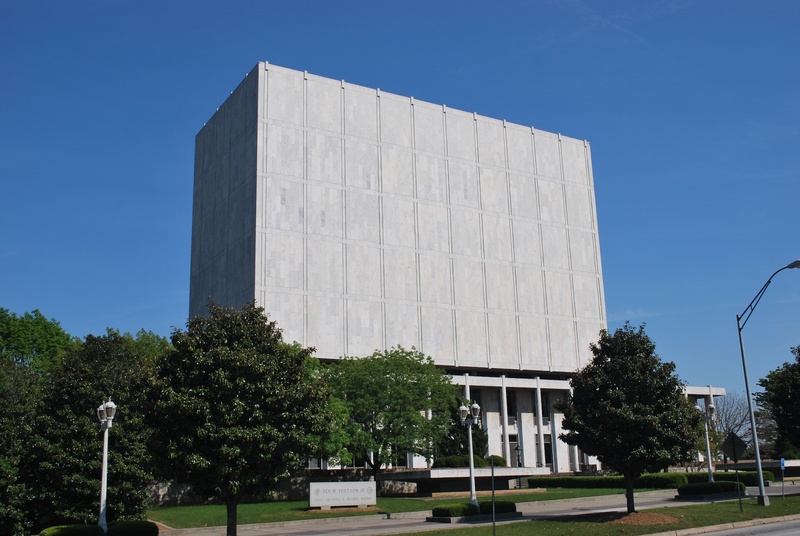 The undergraduate campus is in Macon, Georgia, but the graduate and professional campus is in Atlanta. Annette had some things to get done at school, so I tagged along. We came back to the house, picked up Dave and Kate, another pharmacy student, and went to lunch at Houston’s. Annette and Dave’s roommate, Amanda, is a general manager at the Houston’s we went to in Buckhead, a neighborhood in Atlanta. The food was delicious, and is pictured below. 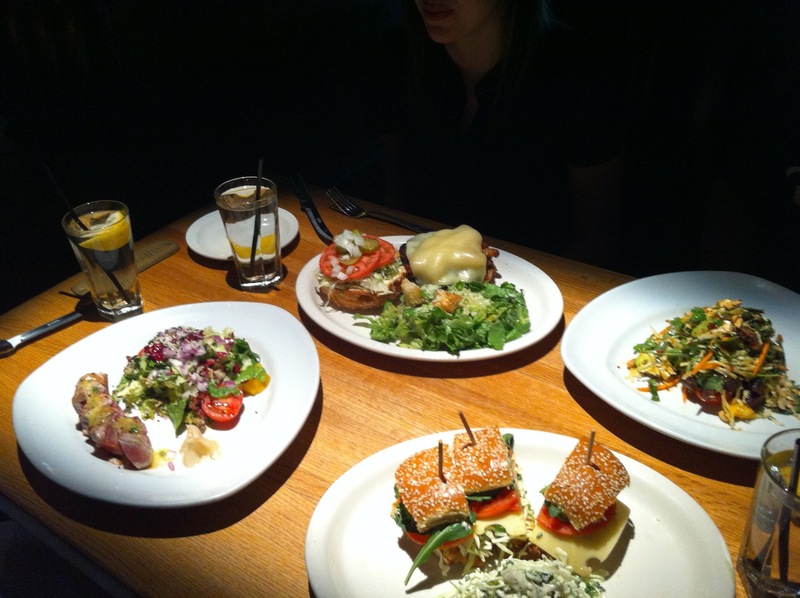 On the lower left is Kate’s meal, which was an Ahi Tuna Salad. On the upper left is Annette’s lunch, which was a veggie burger with… drumroll…… BACON. She’s not a vegetarian and she said she just really likes the veggie burger, and bacon. Dave’s lunch is the Thai Steak Salad, pictured in the top right. I had an amazing Chicken sandwich with arugula, tomato, onion, and slaw. I like coleslaw so much that I also got it as my side instead of fries. After lunch we headed back to Annette and Dave’s, and got ready for the game. The game was at 7:35, and we left the house at 3:40. 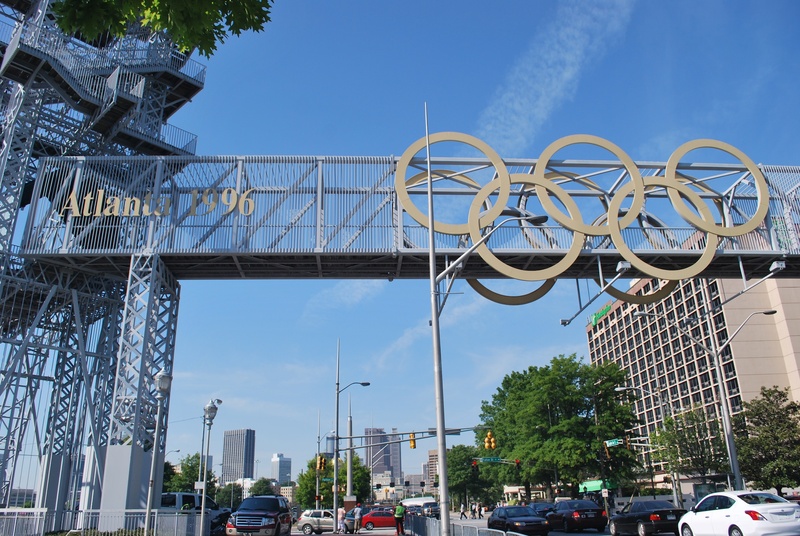 We went to the MARTA (Metro Atlanta Rapid Transit Authority), and caught the train to downtown. 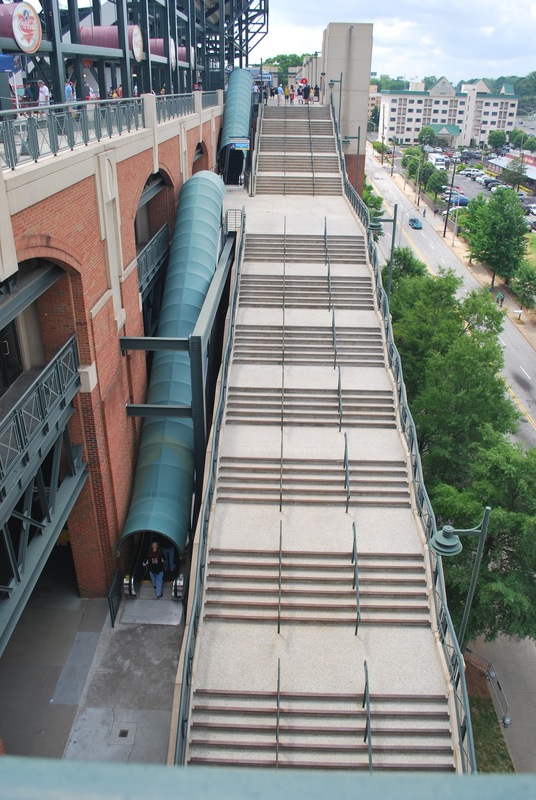 The train doesn’t run right to Turner Field, and they offer a free shuttle from the train stop that starts about an hour before the game. 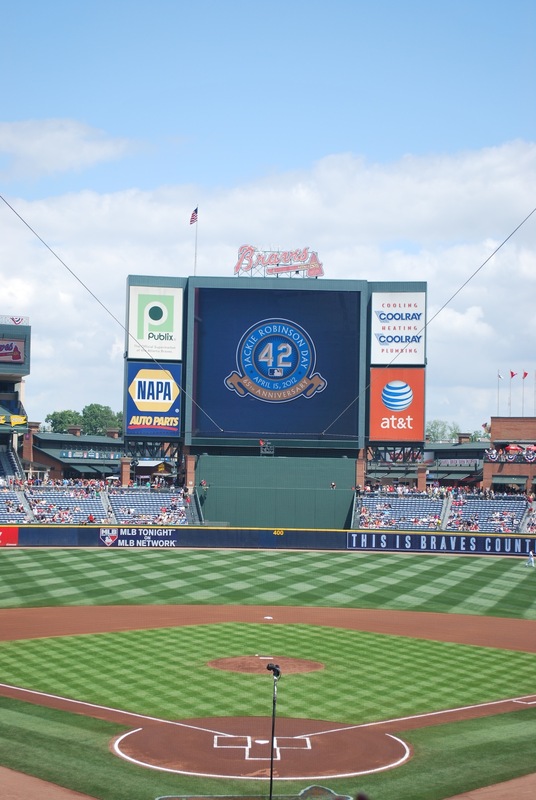 Since we got there around 4:20, it wasn’t running yet, and we just walked to Turner Field. We passed the Capitol building on the way. 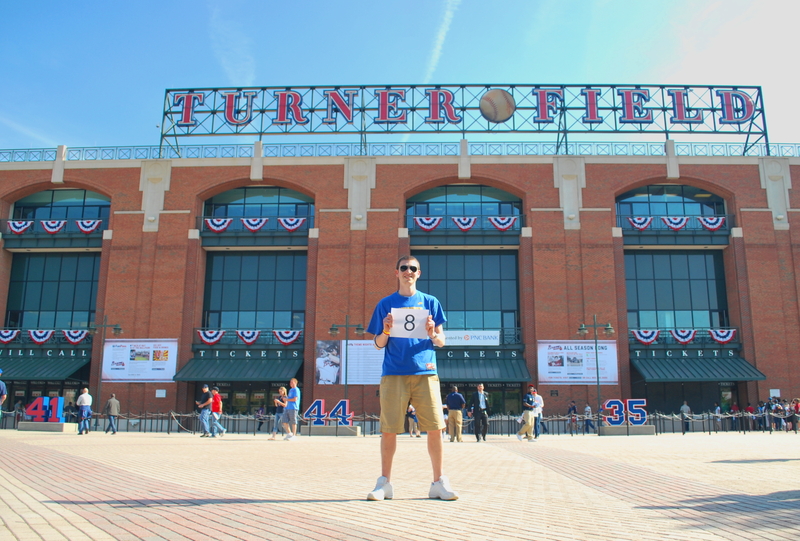 We got to Turner Field around 4:35, with the goal in mind of getting my game number 8 picture taken in front of the home plate entrance. 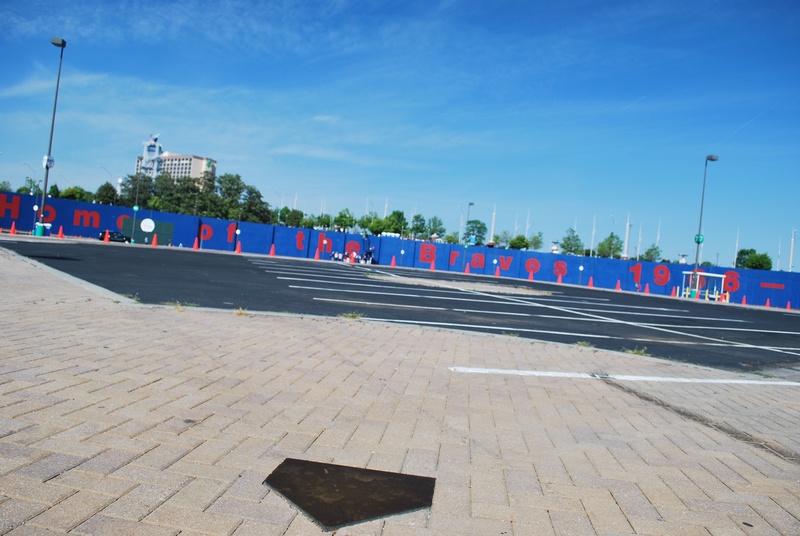 We found out that there was no entrance located near home plate, because there are no parking lots on that side of the stadium. 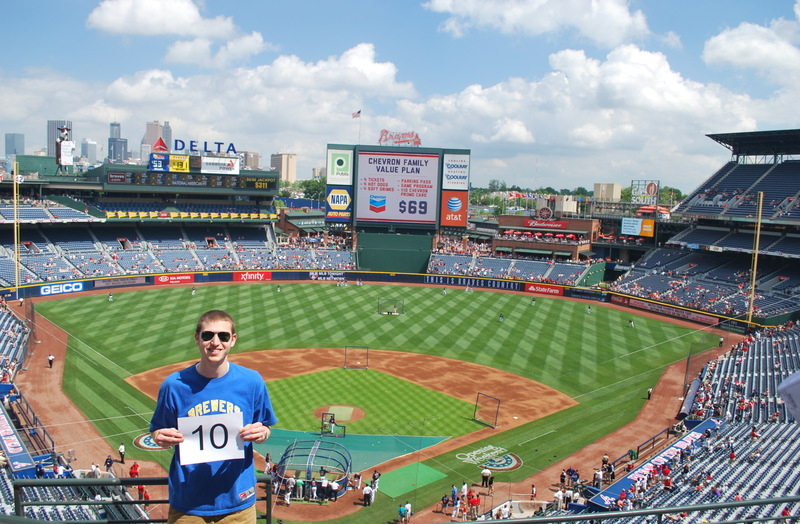 We wound up walking completely around the monstrosity that is Turner Field, and got the picture in front of the Turner Field sign, which is near left field. 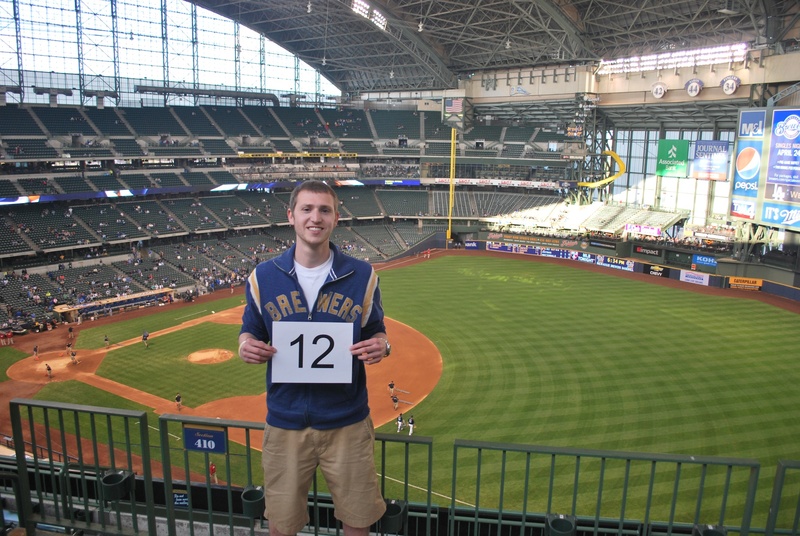 I wanted to get my ticket for the game, which the Brewers were providing, and went to the will call window. 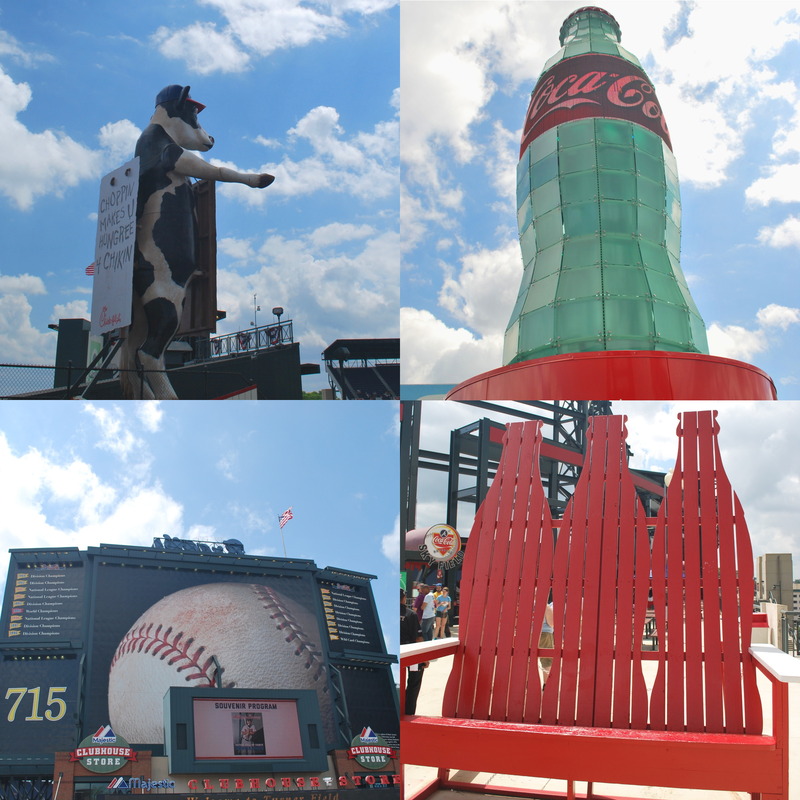 I found out, however, that there is a separate media will call window on the other side of the stadium, which we had walked past on our trek around Turner Field. Dave wanted to get tailgating, so we parted ways, but Annette and I went back to the discrete will call window. It wasn’t labeled as will call, and just had Media gate above the gate where you can enter after picking up your tickets. 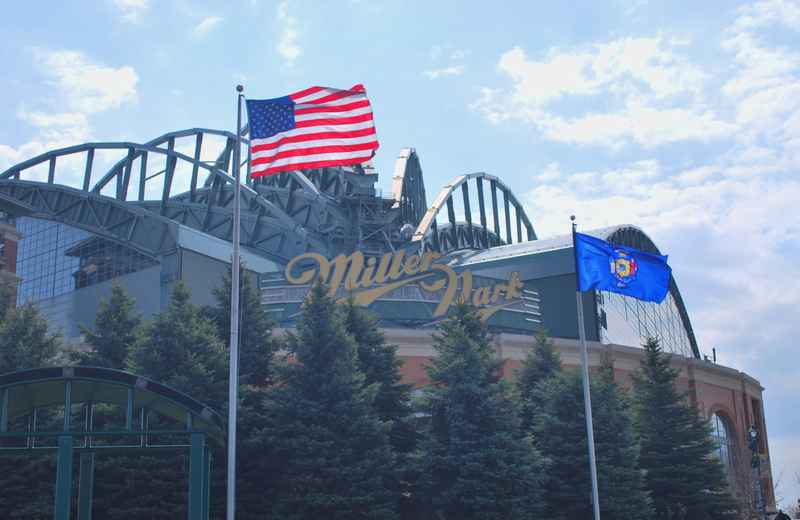 The Brewers had guaranteed that I could get my tickets an hour before the game, but said they will be available before then a lot of the time. Of course, at 5:15 they were not yet available, and Annette and I walked all the way back around the stadium to the parking lot where the tailgate was. 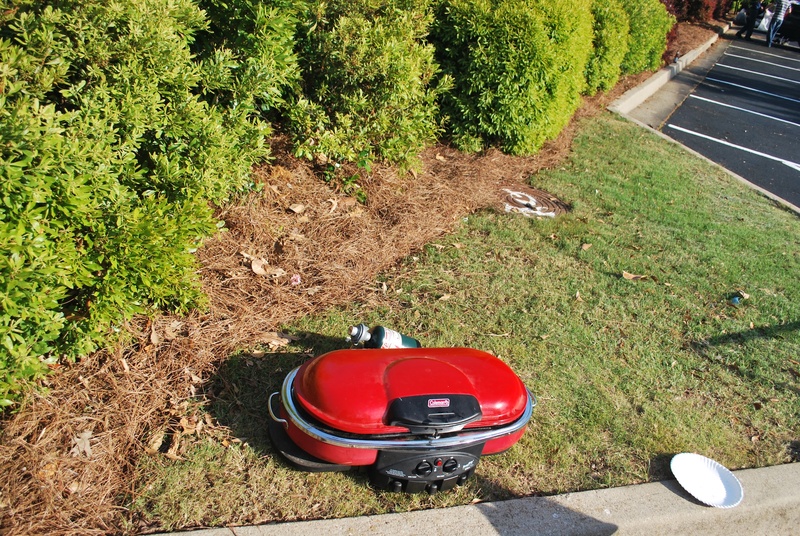 I don’t know if the best place for a grill is on very dry grass, and next to flammable pine needles. I don’t know why they wouldn’t have told us to put it on the blacktop. Any thoughts? We drank some beers, ate some food, and played some washers. I feel like there is a lot more luck involved in washers than there is with corn hole (bags for you non-traditionalists). There were seven of us and a good time was had by all. 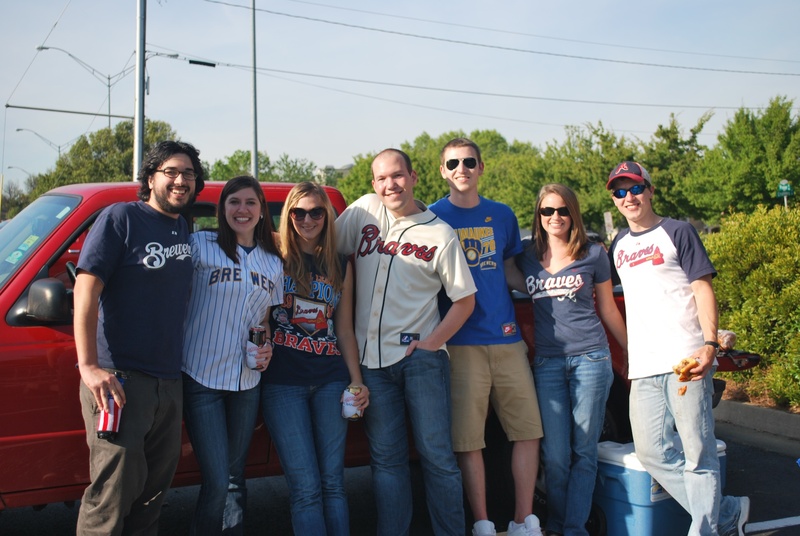 I asked a Braves fan if she would kindly take a picture for us and she obliged. Left to right you have Dave and Annette (my hosts), Kyndall, Bill, myself, Katie, and Steven. Kyndall, Bill and Stephen are all classmates of Dave’s, and Katie is married to Stephen. 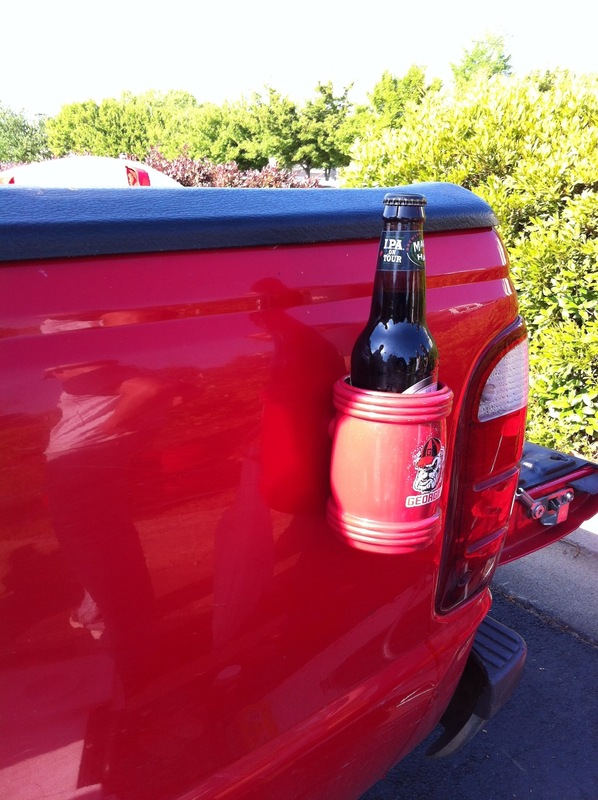 Stephen had a sweet magnetic koozie that is strong enough to hold a full beer!!! I left the tailgate at 7:05, because I had to go back to the media will call window on the opposite side of the stadium to get my ticket, which would now be available. I made it inside and to my seat just in time for the national anthem, which created a pretty nice photo opportunity. They also had a flyover, which was not satisfying at all. 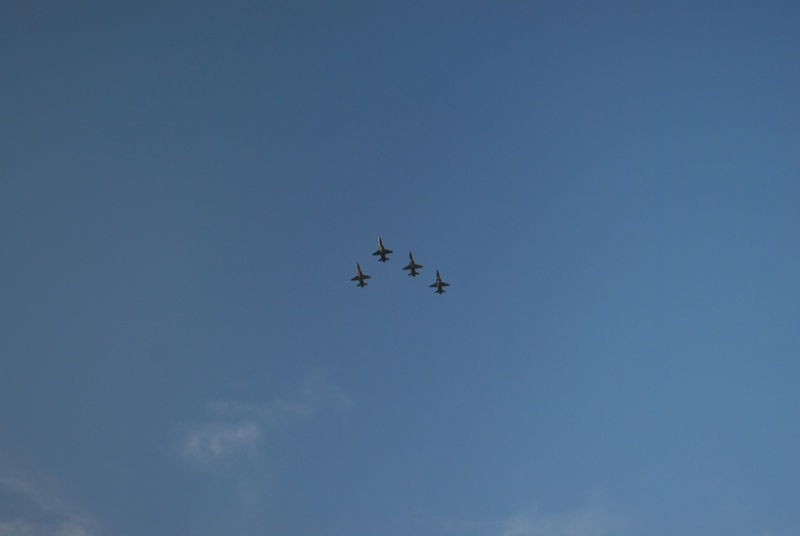 For some reason they came in a lot higher than other flyovers I’ve witnessed, and the result was not very loud. The Crew got off to a decent start and had a 3-2 lead heading into the bottom of the fifth. 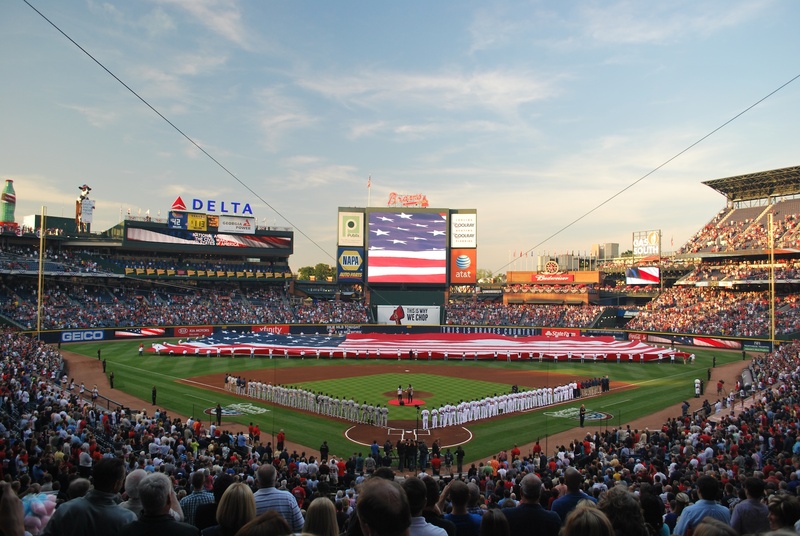 That’s when the Braves blew the game open with a six spot. 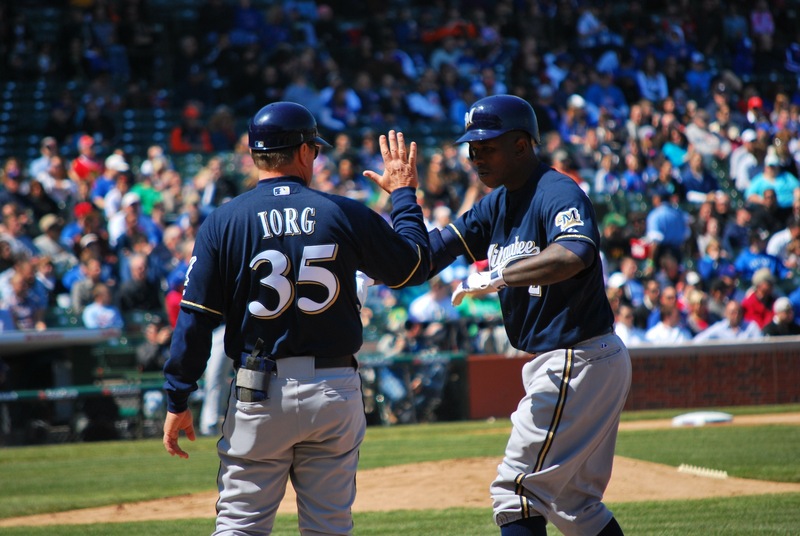 The Brewers battled back and wound up tying it after two in the sixth and three in the seventh. Corey Hart is playing great right now and hit another home run, making it four on the year (on pace for 81!!! right….). K-Rod struggled in the eighth and gave up the two runs, which proved to be the difference. It was nice how they battled back and it’s promising that the Brewers picked up 13 hits and 8 runs, but when you give up 10, it really doesn’t matter. Giving up 18 runs in two games is not the formula for winning games. We took the extremely crowded shuttle back to the MARTA station, jumped on the gold line, and made our way back north. We got back to Annette and Dave’s at 12:20 AM and I was exhausted after my 19 hour day, thus the late post. I’m leaving for today’s game in 10 minutes, and sitting in the outfield with my hosts this time, but I told them no distractions. I didn’t miss a single pitch yesterday, so hopefully I can keep it going. 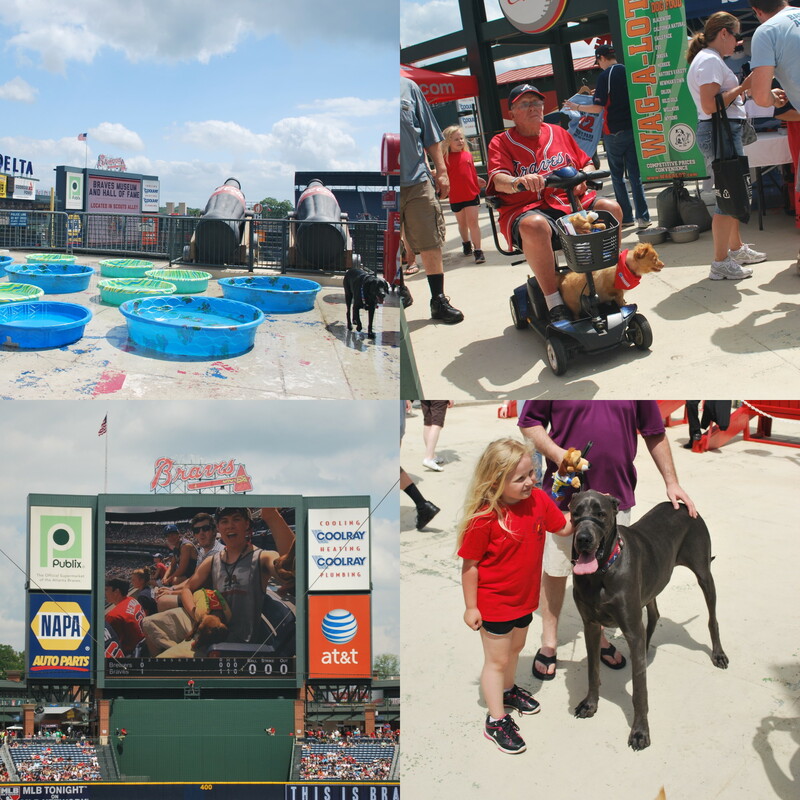 It was a short turnaround from the 7:05 game on Tuesday night to the 1:20 game on Wednesday afternoon. I went to bed after midnight, got up at six to go to the bathroom, and couldn’t fall back asleep until seven. When I got up at 8:20 I felt more exhausted than I had at six. I ate breakfast (Honey Nut Cheerios), while watching Tuesday’s Around the Horn and PTI that I had DVR’d. I’m extremely grateful that Alex and Jess have a DVR, and was able to keep my schedule of watching both ESPN talk shows on a daily basis, at least for the time being. It’s going to be different most other places, including at home, since my parents don’t have ESPN. 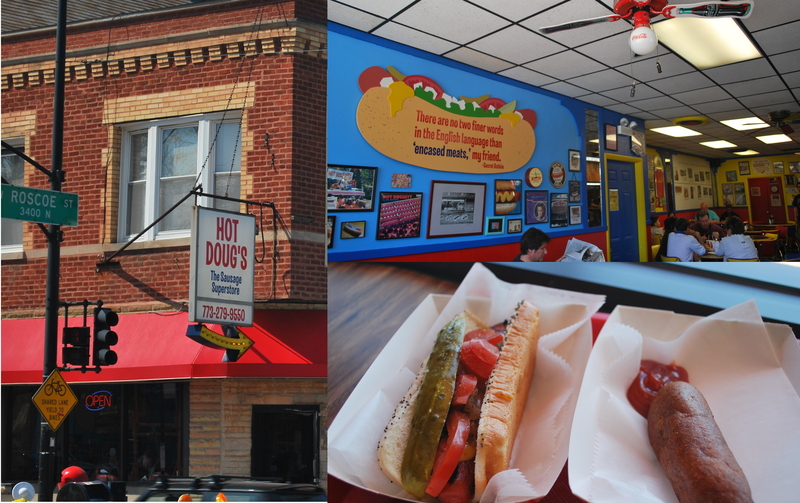 I was planning on catching the 74 bus on Fullerton over to the Red Line, and taking that up past Wrigley one stop, so I could hit up Byron’s Hot Dog Haus. I was looking to get an authentic Chicago style hot dog before I left, and it sounded like this was one of the places to go. I wanted to catch the 12:04 bus from the Albany stop, and I made it there five minutes early. I went to transfer my bus pass from my wallet to my front pocket, and it wasn’t there. I thought that you could pay cash, but I wasn’t sure, and I wouldn’t have had exact change anyways. I ran back to Alex’s building, up to his apartment on the third floor, got the card from my coat pocket, and tried to make it back to the stop in time. As I turned onto Albany, I saw the bus pulling away from the stop, just 60 yards away; awesome. I wound up just walking along the bus route and caught the next bus, while getting some “exercise”. On the way I took a few pictures, the first being from the Fullerton L-Train stop. I tried looking into who is painted on the side of the building, but I had no luck. 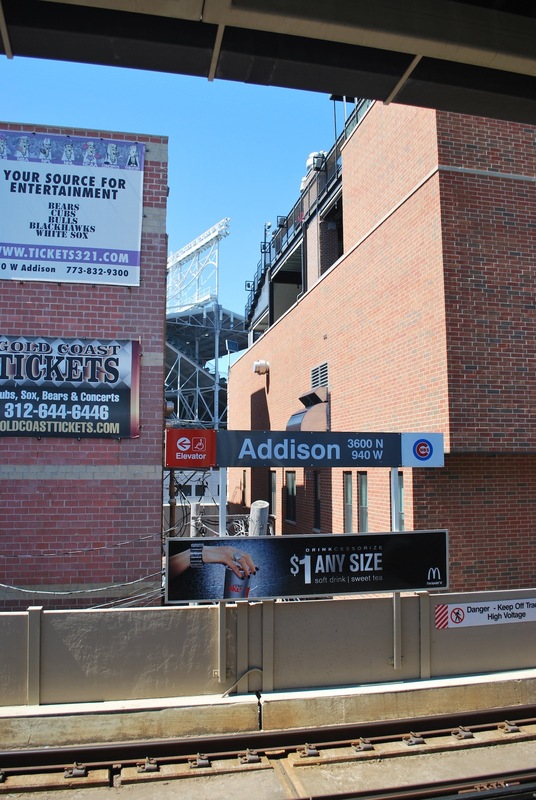 The next is of the Addison stop with Wrigley in the background. 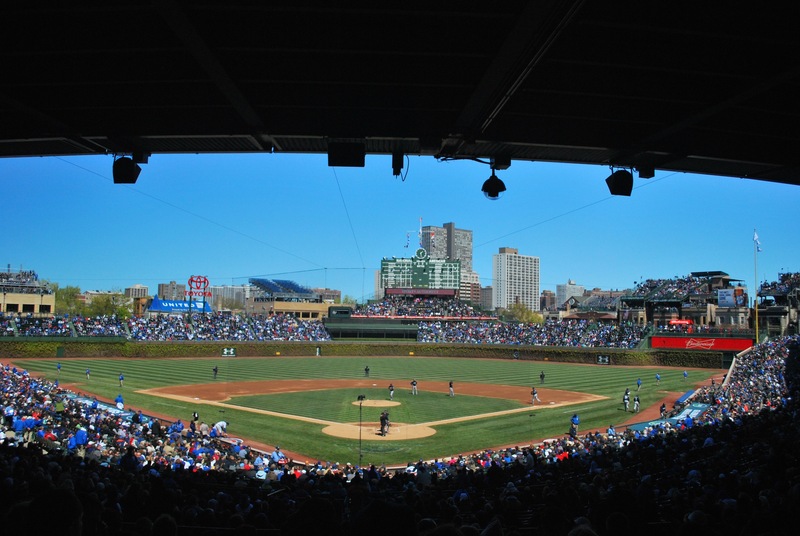 People can say what they want about Wrigley Field, but it’s NINETY-EIGHT years old. You can say it’s run down and hate on it for that, but why? Because it doesn’t have all the flashy lights and replay boards as other parks. 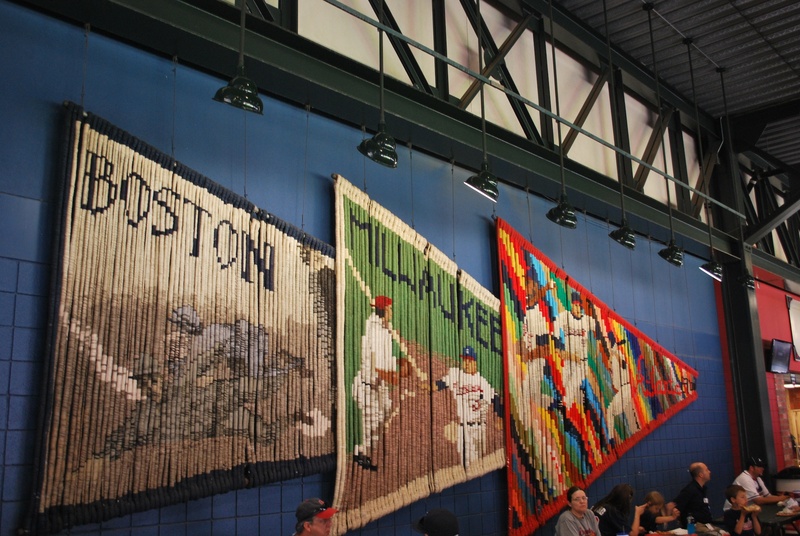 That’s one of the reasons I love baseball; there are aspects of every ballpark that makes them unique. Since I cost myself 15 minutes with the missed bus, I decided not to try and make it to Byron’s before the game, and am planning to do so before Thursday’s finale. 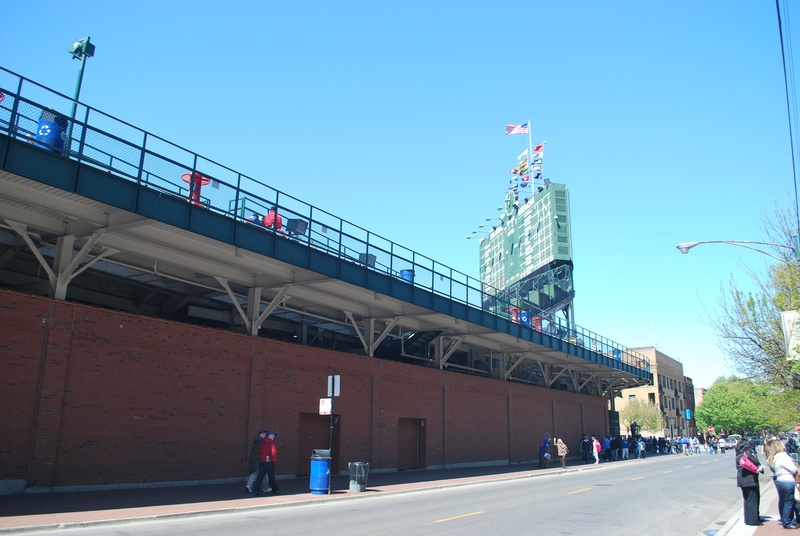 I got to Wrigley at 12:45 and had a some time to kill, so I walked around the exterior taking it all in and enjoying my “retirement”. This is the view up at the scoreboard from across Sheffield. I picked up my ticket from the player will call and found my way inside. I made a pit stop at a hot dog stand and ordered a bison dog. By the time I got around to eating it, it was somewhat cold. I had to locate my seat, and by that time the National Anthem was starting. I’m not a fan of stuffing ones face whilst honoring thy country, so I waited. 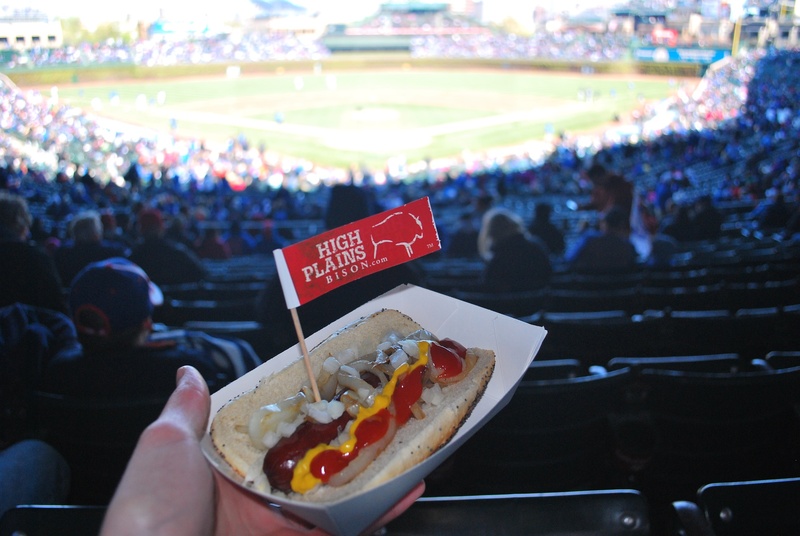 The bison dog was good, not sure if it was $6.50 good, but that’s ballpark food for you. They want to reassure you that it is in fact bison (I’m not sure if I could tell), by sticking it with a little pennant of sorts. 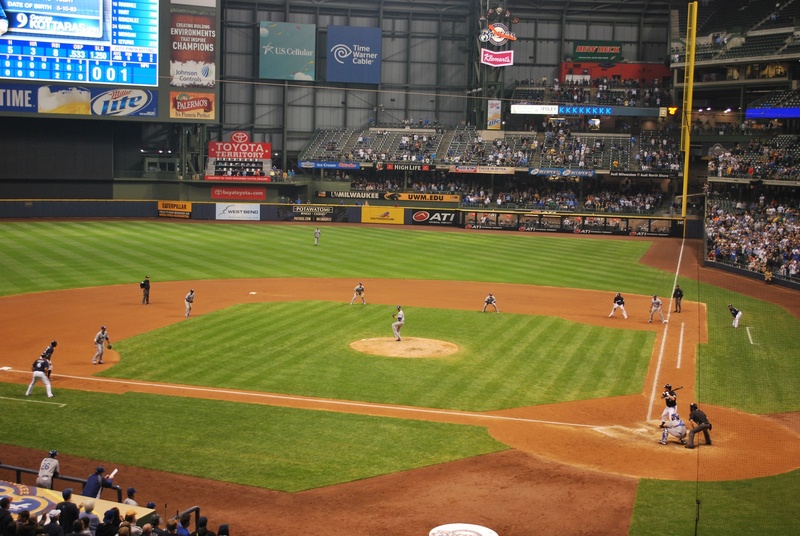 The game started and it looked promising early as the Brewers put runners on the corners with only one out. 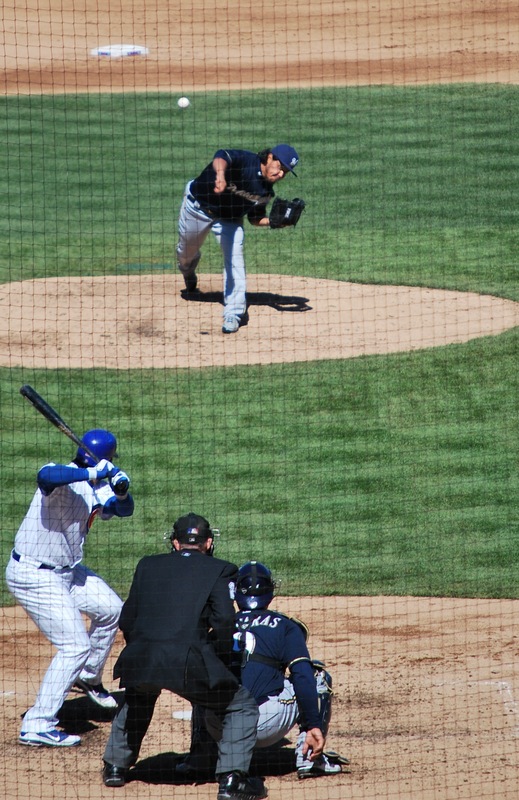 Aramis squashed the rally by grounding into an inning ending double play. He went 0-4 and is 2 for 18 on the young season. I won’t say that I’m a little worried, but I’m a little worried. He has proven to be a slow starter in the past and picked it up later, so hopefully that trend continues. 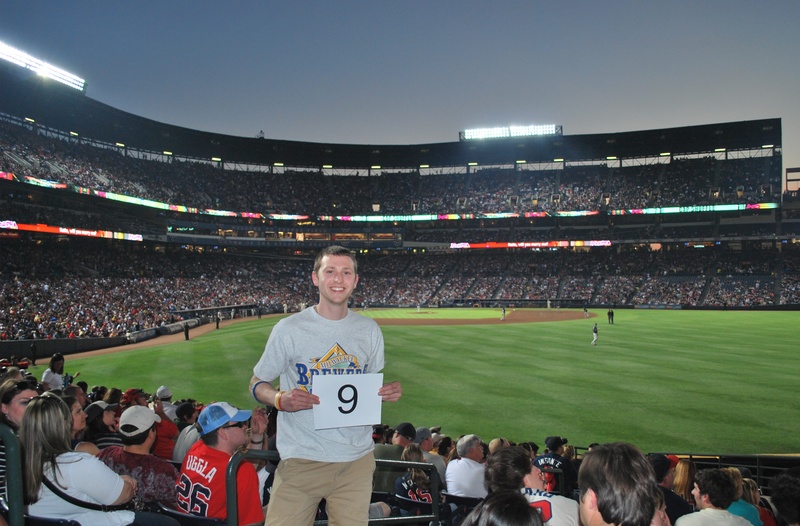 Early in the game I got a guy who was sitting behind me to take game photo number six. He was from Greenfield, WI, and was in town for a college visit with his son (and family) at Depaul. I also talked to the guy I was sitting next to, and learned he was friends with Randy Wolf. He said he wasn’t a Cubs fan and was just a fan of baseball, he seemed like a genuinely nice guy. Those of us not in the sun froze our butts off during the game. I don’t know why I didn’t bundle up like I did for Monday’s game. I would argue that it was actually colder for today’s game, even though it was during the day. I think the combination of not being in the sun and a 10 mph wind coming in from centerfield made the difference. At Alex’s place I had; a coat, gloves, winter hat, long underwear, and hand warmers. 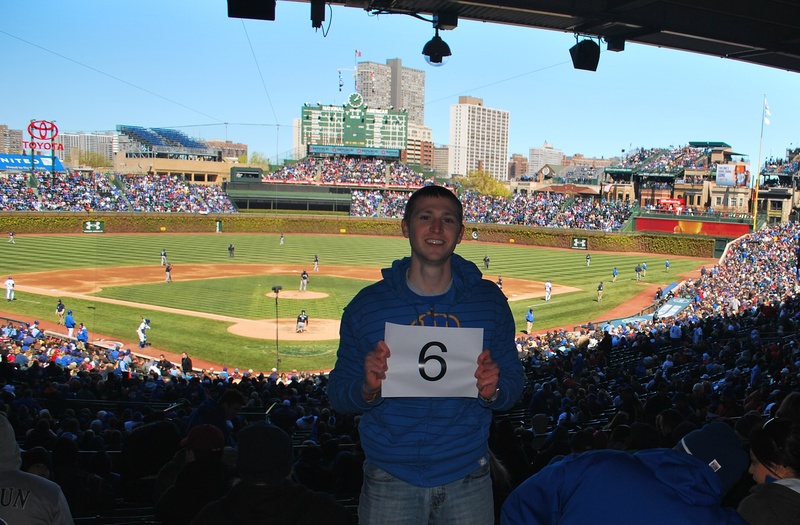 Of the five I wore/brought… ZERO. 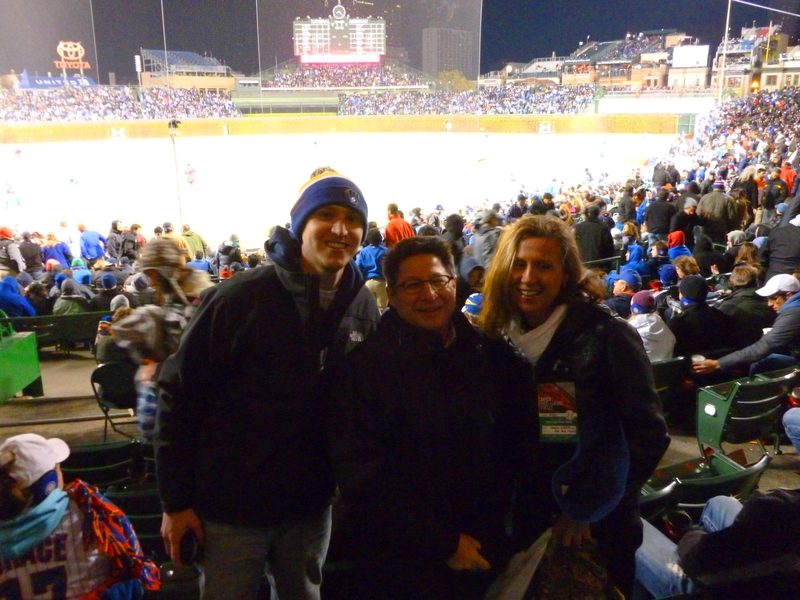 I did have the Cubs earmuffs with me, which was the fan giveaway from the day before. I was planning on selling them, but was too cold to try and sell them, and too stubborn/loyal to put them on. Despite the screen making the shots not as pretty, I was able to freeze the action pretty good due to the sunlight. Here is Gallardo throwing what I think is a changeup. However, MLB.com’s play by play says that Gallardo didn’t throw any changeups to Geovany Soto today. You can correct me if I’m wrong, but I’m almost positive that is Soto, due to the other pictures I took right before and after. And I think it’s a changeup because his pinky is on top, meaning he rotated his arm counterclockwise when he was releasing it. 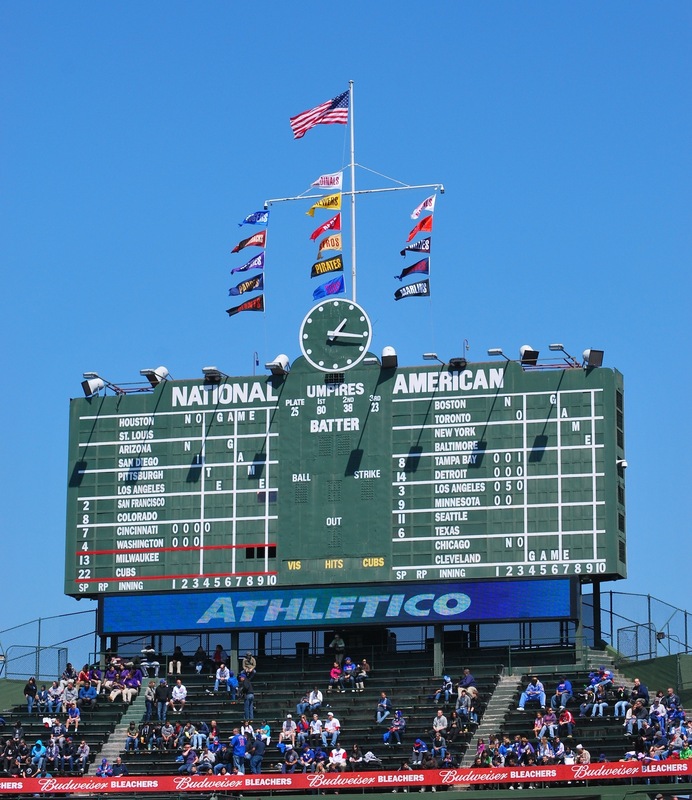 Perhaps MLB/Wrigley Field needs some better pitch detection equipment. 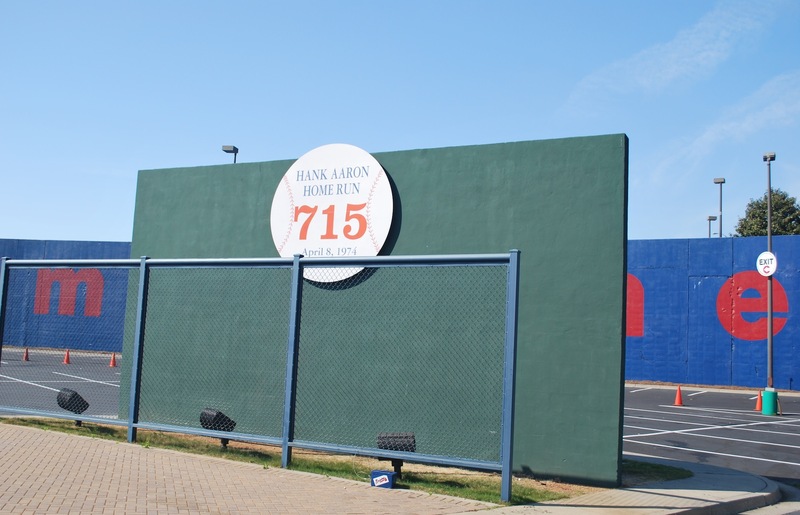 I was really expecting a loss the way things were going, an example would be Gamel’s screaming shot off the right field wall that probably knocked a few bricks loose. It wound up being a single because it caromed off the wall so hard it went right to DeJesus who was playing right field. 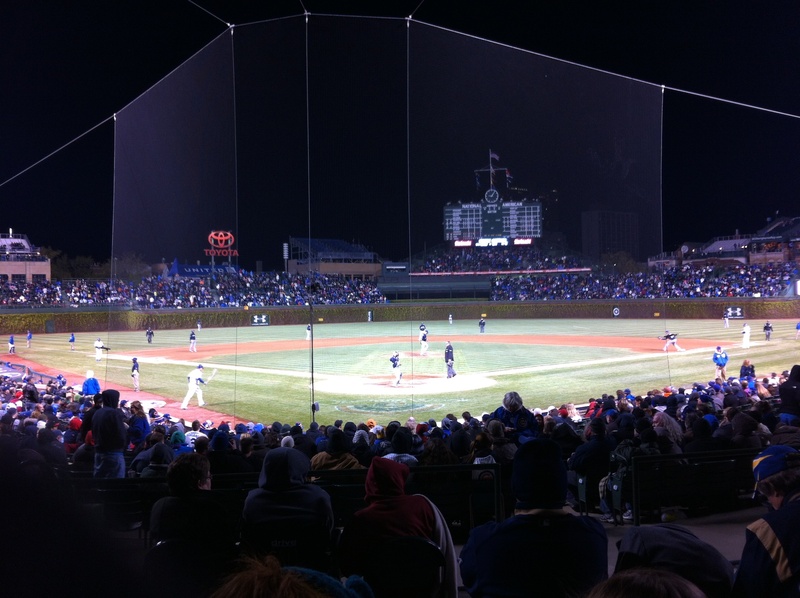 The Cubs held a 1-0 lead from the bottom of the first into the top of the seventh. Gamel doubled to lead off the inning and a Cubs fan sitting behind me had some words. “He rolls like a f****** caterpillar down the first base line!” he proclaimed. We all got a good laugh out of it, but he didn’t seem too amused. Kottaras, who was getting a spot start due to soreness in Lucroy’s rib cage muscles, followed Gamel’s double with a home run to right. Just like that the Brewers took a 2-1 lead that they wouldn’t relinquish. The “uneducated fan” moment came in the BOTTOM of the eighth. A couple of Cubs fans behind me were debating if the game was in the top or bottom of the eighth. One guy finally said, it’s the top of the eighth, they agreed and then stated it again but not too confidently. I turned and told him it was the bottom of the 8th, because the Cubs were batting. He said “oh, i don’t know, I’m not paying attention” followed by “well, they didn’t announce it!” I couldn’t help but laugh. I think he thought it was funny as well, either that or he wanted to kick me in the back of the head for laughing at/with him, but I’m confident it was the former. I did miss two, yes two (2) pitches at this game. But I have very good reasons for both of them. I missed the 2-0 pitch from Dempster to Gomez in the top of the seventh. A vendor was yelling “HOT DOGS!” and it kind of sounded like “MARCO!”, a bunch of kids were responding with “POLO!”, I glanced over at what was going on and missed the pitch. I also missed the 1-2 pitch from Marmol to Gamel in the ninth. Gamel had pulled a pitch foul that was an absolute ROCKET. It went right over the 1st base dugout and looked like someone may have gotten hurt. I was looking over there and missed that pitch as well. I’ll leave you with the view from my seat during the game, you can see it in the background of my game number six picture (and Bison Dog picture), but this one provides more detail, since the field is in focus. I like how it’s almost a panoramic by itself, since the underside of the suite level is dark, and the shadow of said suites make the seats and people below them dark. Tuesday was a lazy day leading up to the game. Since I had gotten a $60 parking ticket the day before, I figured it would be wise to make up for it by just having a PB&J at Alex’s place. A short nap followed and I was ready for game number five. I think naps are going to become my new best friend over the next 176 days. After working for 14 months, and getting up at 7:20 every day, I think my internal clock is set to wake up at that time no matter what. I left Alex’s place at 4 to head up to the game. I got off the Red Line a stop early and hit up Jimmy John’s to get a sub for the game. My usual is the Big John, and I add cucumbers and onions. I didn’t really need or want anything for Christmas, and seeing that I’d be on the move during the baseball season, I asked for Jimmy John’s gift cards. I think I wound up with $150 worth of Jimmy John’s and $75 worth of Noodles gift cards. Most of the major cities I’ll be in have JJ’s near the ballparks. 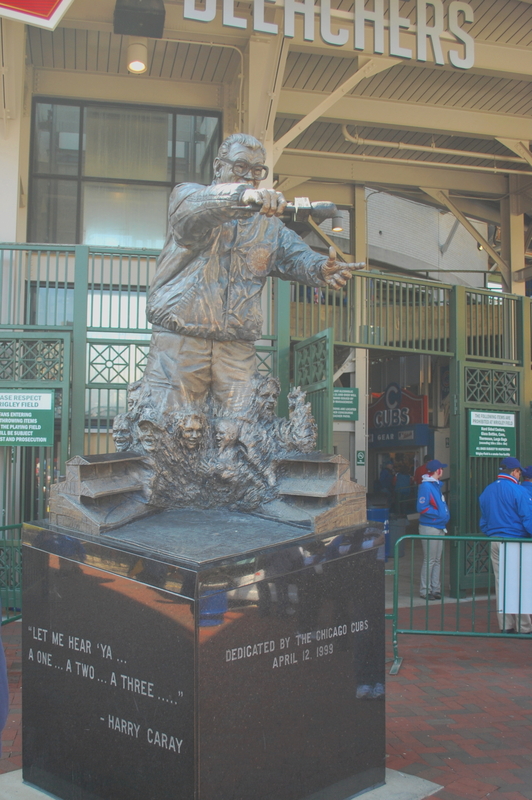 I walked up Clark to Wrigley and arrived at 5:35, which was 25 minutes early. That probably wasn’t the smartest idea since it was going to be the coldest game of the year for me. On second thought, I guess I’d rather be early than late, so I can’t complain. At six I met outside the will call windows with Tyler Barnes, and Joan Watkins, the Director of Public Engagement for Be The Match. 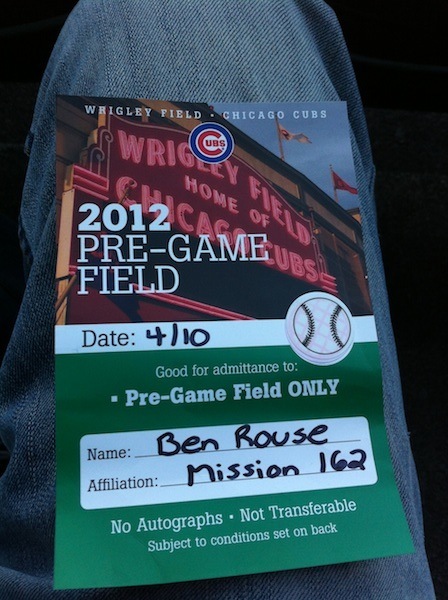 We picked up our tickets from the player will call window, and put on our credentials which allowed for field access. 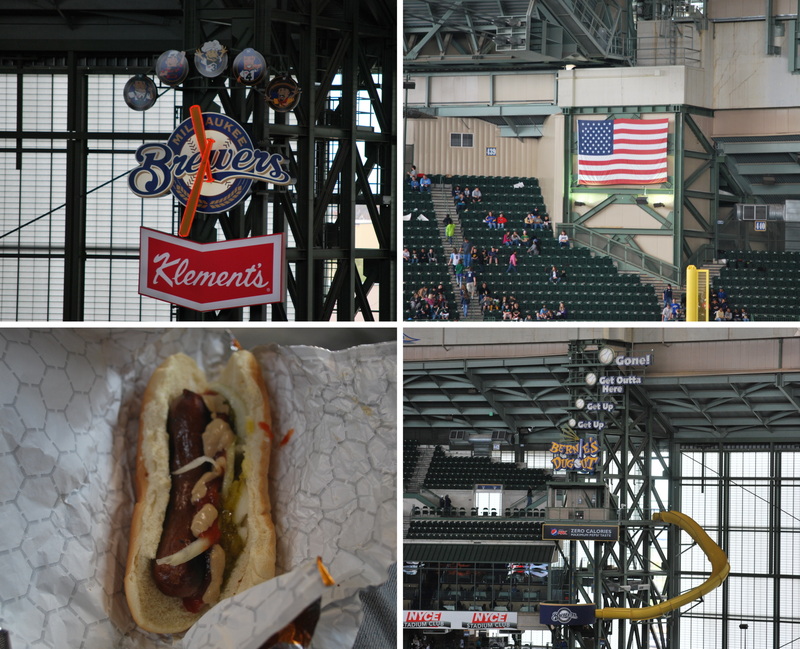 We made our way down to the camera well to the right of the Brewers’ (1st base) dugout. We talked there for a bit with Tyler and he introduced us to Craig Coshun, I probably should’ve gotten a picture with him but didn’t. 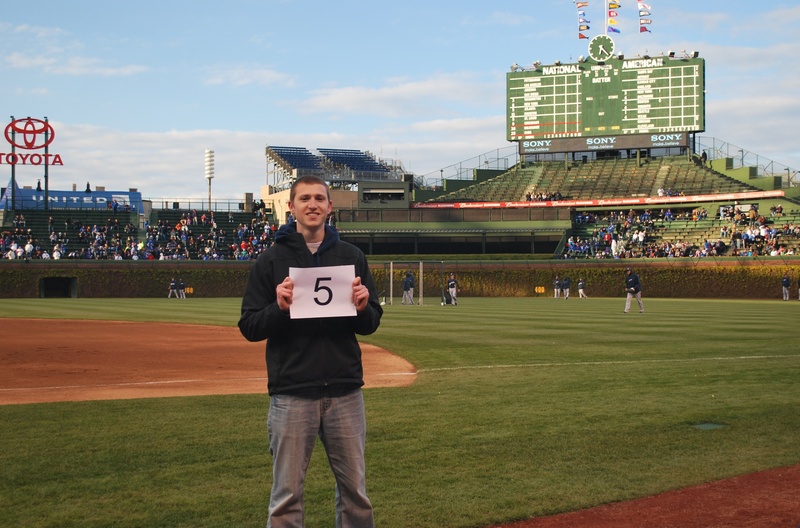 Since I had field access, I couldn’t pass up the opportunity to get game number 5 taken on the field. Craig informed us that we wouldn’t be on until 6:45 so we had some time to kill. Joan had a friend with her, who is from Chicago and is a Cubs fan. 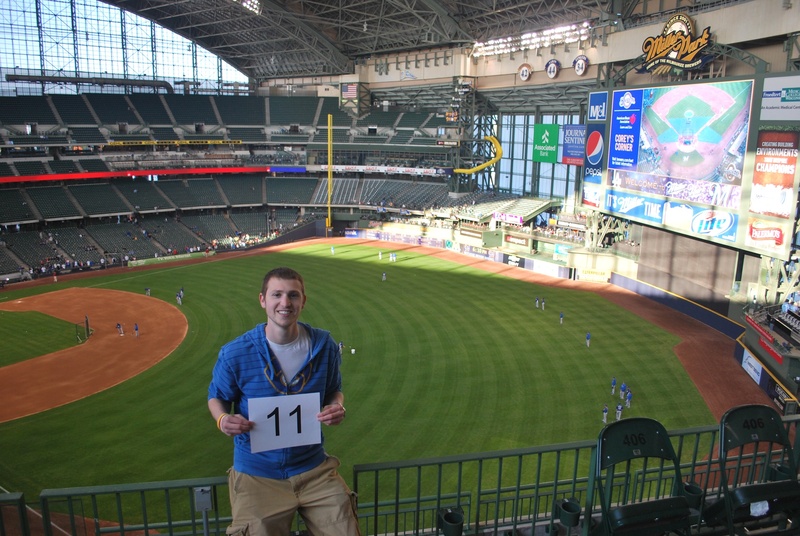 His name is Mick and he’s actually friends with Mark, the guy who sits right behind the visitors tunnel at Miller Park. If you watch the games on TV, every time they show a right handed batter hit a home run, he’s the guy in the background standing up and putting his arms in the air. Small world. 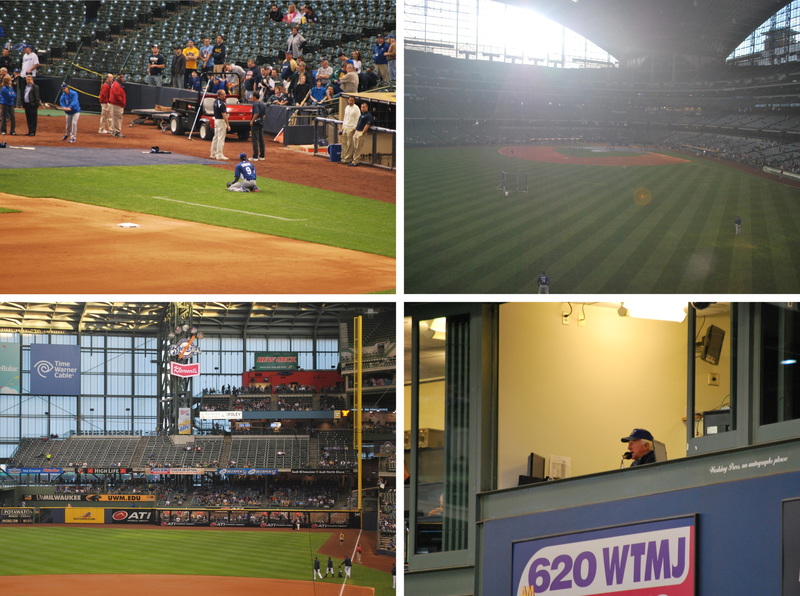 Craig and Auggie were doing Brewers Live, and at 6:45 Auggie came off the field and sent Joan and myself down. I think the cold actually helped calm my nerves, since it gave me something else to think about. I gave Mick my camera and instructed him to take some pictures when I was out there. I also told him to move a little closer to home plate so the sun wouldn’t ruin the shots. I probably should have instructed him to stay there for when I was actually on air, but I failed to do so. This first photo is when we were waiting for the show to get back from commercials. And this is the best shot of me during the interview. As you can see the angle from above would have made for a much better picture. I can’t blame Mick for trying, and he did say as I was giving him my camera that he might not be the best person for the job. I didn’t have any other options, so I’m still grateful for his willingness to help. I was only on air for a minute or two. 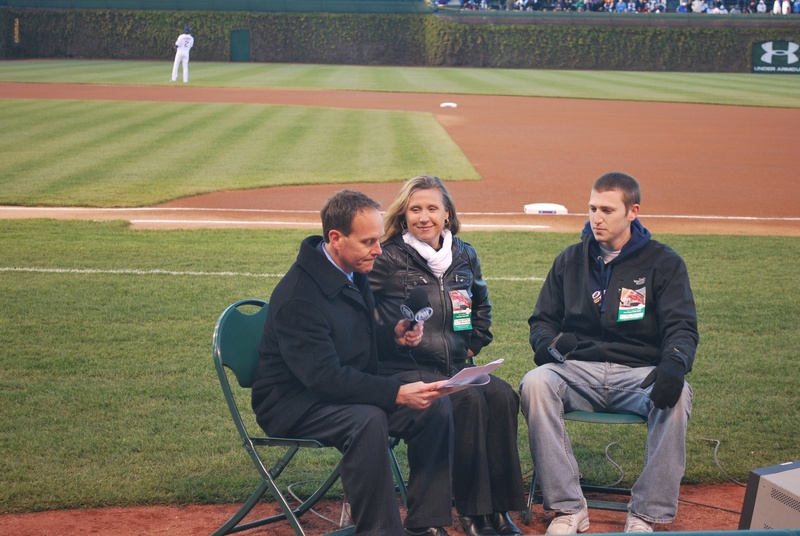 They were announcing the starting lineups as Craig was introducing the viewers to what I was doing. I honestly did not hear much of what he said because of the announcer and the crowd’s reactions. I luckily heard the last bit of what he said, so I at least could start my answer in the right format. If not it could have been one of those awkward situations similar to when someone asks “How are you doing?” and you answer “Nothing”, because you expected them to ask “What’s up?” I looked for the video online but couldn’t find it, and I’m not sure if they’ll put it up anywhere. A few friends said I did fine, so that’s good enough for me. A male friend of mine from high school texted “You look soooooo dreamy live on TV!”. A little strange, I’ll admit. 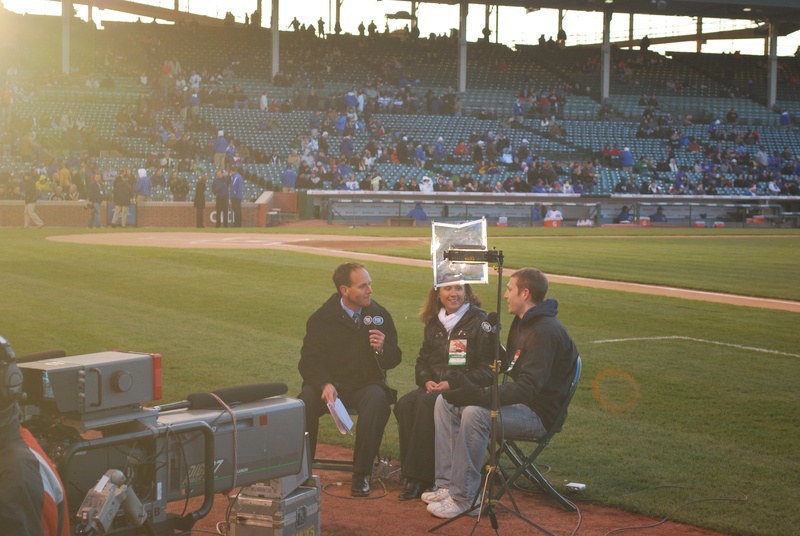 After the interview I headed over to my seat which was right behind home plate. 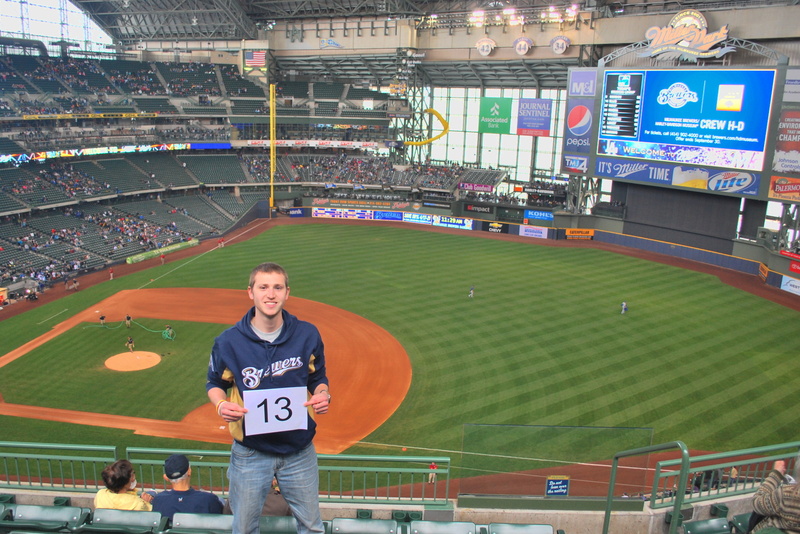 This was the first time I was using a ticket that the Brewers provided. I will admit it’s a great view of the field. For some reason my DSLR and point and shoot cameras produced horrid results, and the previous photo was taken with my iPhone. The field looks like it is made up of flood lights. An example would be this picture of myself, Mick and Joan. I’m guessing you just have to use the manual option to find a setting that works, it might also have to do with the protective screen deflecting light or something like that. I think sitting behind the screen is going to take some getting used to. 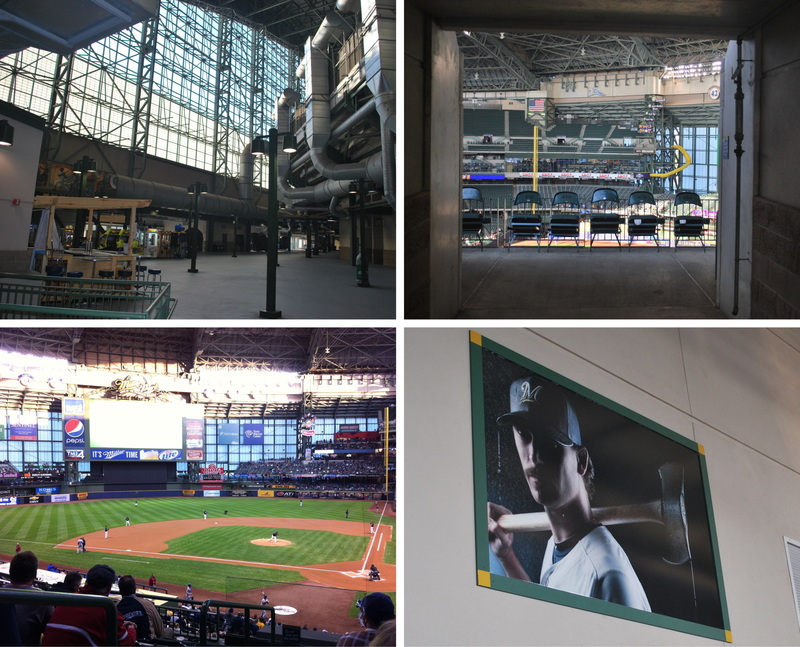 I’ll be using the Brewers provided tickets 50 or so times this season on the road, and will likely be located behind the screen at each game. I’ll be sitting near the family and friends of the players, and they want to keep them safe from screaming line drives and flying bats. I did miss one pitch at the game. My seat was two rows behind Mick and Joan’s, and I moved down to sit with them. We were in somebody else’s seats and had to slide down the row. In the commotion I was distracted and missed the 3-0 pitch to Soriano in the bottom of the first. I’ll just have to start a new streak. I’m not sure which pitch I missed on opening day, so I don’t know what the streak was, but I know it was around 1,050 pitches. The game itself was enjoyable, a five run first is never a bad thing. We had chances to tack on more but didn’t take advantage, and left 10 on base. The Crew made it interesting in the 9th for the second straight night. It felt like 34 degrees at 10:20 and I was ready to be some place warm. I wish I could say I was shaking because I was nervous K-rod might blow it, but I was shaking because I was absolutely freezing. He got the job done and the Brewers improved to 3-2, hopefully Gallardo can keep the momentum going with his start today, and erase the troubles he had on opening day. My favorite “uneducated fans” moment came when a Cubs fan behind me said “we should get a hit off this guy, he’s got a 4.5 ERA.” This was in the fifth inning, and he was referring to Narveson. I don’t think he realizes that the 4.5 ERA is based solely on the first four and 2/3 of the ONE game, since it was Narveson’s first start of the year. Wow. I wonder what would’v happened if Axford came in and he saw his bloated early season ERA of 13.50, he probably would’ve claimed that he could get a hit off of Ax. First pitch is in 2 hours 20 minutes, so that’s all for today.